The Wilson's Phalarope is a slender, very active shorebird. Of the three species of phalarope, Red, Red-necked, and Wilson's, the Wilson's is the most terrestrial, and the most likely to be seen in Tennessee. 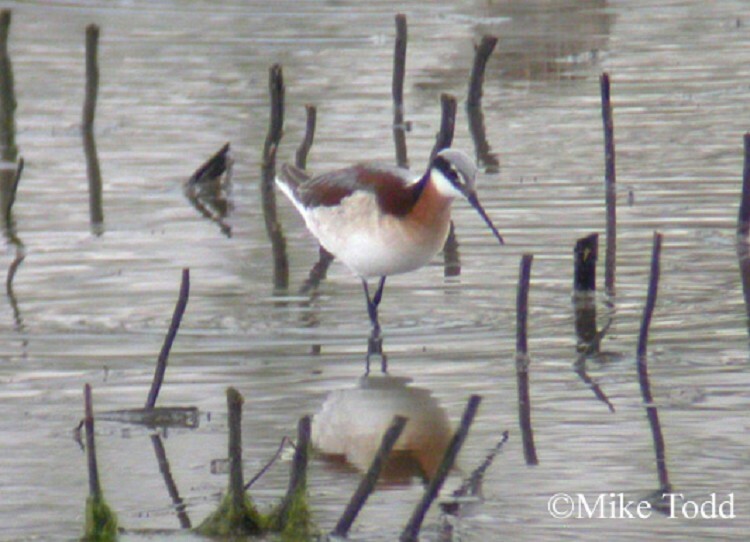 What really sets the phalaropes apart is the gender role reversal during the breeding season. It is the female that are larger and more brightly colored, and she is the one that arrives on the breeding grounds first, competes with other females for the best nesting territory, and aggressively defends her nest and mate. Once she lays her eggs, she begins her southward migration, leaving the male to provide all the parental care. The Wilson's Phalarope breeds in the wet prairies from the southern Yukon Territory southward to central Nevada and eastward to the Great Lakes, and winters mainly in the altiplano of Bolivia and Argentina. It is found in Tennessee during migration; in spring it passes through mostly during the first half of May, and in fall, when it is more likely to be seen, it can arrive as early as late July, with most birds gone by mid to late September. Description: This medium-sized sandpiper is slender overall with a small head, a thin needle-like bill, black legs, and a white rump that is visible in flight. In spring it is gray above and white below. The female also has chestnut and black on the back, and a heavy black eye-line that continues down the neck, edged with chestnut in the front. In fall both male and female are pale gray above, and white below. Immature birds (July-August) look similar to fall adults but are mottled gray-brown above. Voice: Call is a low, muffled, grunting. Stilt Sandpiper is similar in non-breeding plumage, but is not as pale gray, and does not forage as actively as Wilson's Phalarope. Lesser Yellowlegs is similar in non-breeding plumage, but is not as pale gray, and is slower, more methodical, and graceful when foraging. Habitat: In Tennessee, grassy borders of shallow lakes, ponds, and marshes. Diet: Aquatic insects and small crustaceans. Nesting and reproduction: Wilson's Phalarope has never nested in Tennessee. Status in Tennessee: The Wilson's Phalarope is a rare migrant, more frequently found in fall than spring. It can be present in the state from mid-April to mid-May and from early August to mid-September. The genus name, Phalaropus (coot-footed), refers primarily to the partially webbed feet of the Red and Red-necked Phalarope species, both of which winter at sea. Wilson's Phalarope is more terrestrial and has only small flanges on its toes. Wilson's Phalarope was first described in 1819 by Louis Jean Pierre Vieillot (1748-1831), a French ornithologist who fled Haiti for the United States during the French Revolution and began studying the birds here; 26 of the genera established by him are still in use. He named this phalarope to commemorate the American ornithologist Alexander Wilson (1766-1813). Best places to see in Tennessee: The ponds at Ensley Bottoms are one of the most reliable places to find Wilson's Phalaropes. Colwell, M. A., and J. R. Jehl, Jr. 1994. Wilson's Phalarope (Phalaropus tricolor). The Birds of North America, No. 83 (A. Poole and F. Gill, eds.). The Academy of Natural Sciences, Philadelphia, PA, and The American Ornithologists' Union, Washington, D.C.